Blurb- Optimum oil therapy featuring Micro Oil Technology. Micro Oil penetrates hair with micro beads of natural oil to help nourish, repair, strengthen and protect hair. 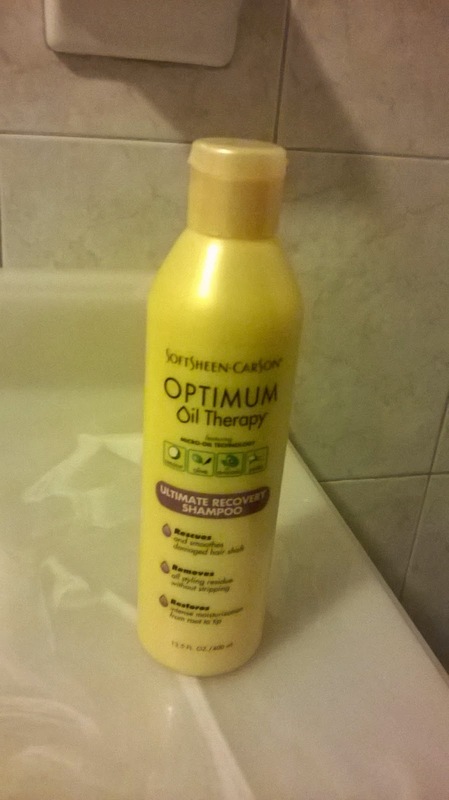 Optimum Oil Therapy Ultimate recovery Shampoo Cleanses, instantly softens and revitalizes dry damage prone hair. Nourishes hair with natural extracts of coconut , olive, avocado, and jojoba. Ingredients- Aqua/water, Sodium laureth sulfate, Disodium cocaamphodiacetate, sodium chloride, glycol distearate, glycerin, cocamide mipa, Disodium ricinoleamido MEA-soulfosuccinate, Polyquaternium-10, Carbomer. Etc. Pros- This shampoo does all it promises to do. This shampoo is very creamy and smells like clean hair. It has a great lather and rinses clean without leaving any lingering smell as most shampoos does. I was very skeptical about the "Micro Oil Therapy" but I must say I was pleasantly surprise at how soft and shining my hair felt. Cons- I have being using this shampoo for the last two weeks (three washes) and have yet to find a con. The directions suggest using the corresponding conditioner but I did not like the out come of the combination (I only did it once) but that may just be me. My Take- This is a really great product; I pick it up because a need a conditioning shampoo for my mid week wash. My hair feels soft and clean and the best part it has a corresponding conditioner which makes it a home run. I was a little perturb because the ingredients were mostly listed with scientific names but after researching the different compounds I understand the Micro Oil Technology. This shampoo will definitely become a part of my arsenal of must have products. Have you used it? What's your take? Great review doll. It's too bad I don't use shampoo anymore. I am stuck on clarifying conditioners. I wish I could get my scalp to cooperate with cleansing conditioner, but like an unruly child it wont.